Brad Lawrence focuses his practice on intellectual property (IP) counseling including the protection of clients' inventions through carefully planned patent procurement, integrated with other strategic considerations, including development of licensing strategies and analysis of the IP and product positions of others. Brad also devotes a significant amount of time to performing product clearances in the form of non-infringement and/or invalidity opinions. He also has significant prior litigation experience that includes many aspects of patent, trademark, and trade secret litigation as well as licensing and other extrajudicial resolution of IP disputes. Cantor Colburn is sponsoring The 16th Annual Protecting Innovations for Financial Services Industry Summit on July 24-25, 2019 in New York City. Cantor Colburn is sponsoring The 5th Annual IP Strategy Summit: Chicago on June 5, 2019, where partner Brad Lawrence will be a featured speaker. 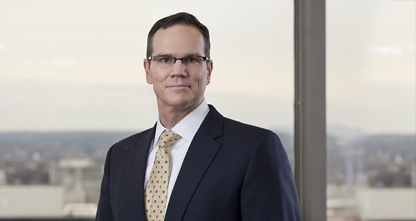 Brad will be part of a panel discussion entitled, "Prosecution and Portfolio Management: Inconsistency, Complexity & Budgets," and will lead a roundtable discussion.